A dedicated cardiologist, Dr. Peyman Naji caters to the locals of Lakewood, CA, where he runs his own practice. Patients visit him for a wide array of medical concerns, such as high blood pressure, chest pain, coronary artery disease, heart failure, heart rhythm abnormalities, varicose veins, peripheral vascular disease, and valve disorders. Dr. Naji performs cardiovascular interventions such as balloon angioplasty and stenting in coronary and peripheral arteries. Dr. Naji is also affiliated with Lakewood Regional Medical Center and strives to make each patient’s visit a pleasant and pain-free experience. He believes that it’s a true privilege to earn patient’s trust and help them heal. 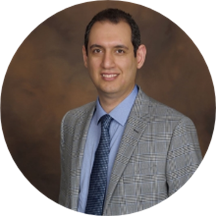 Fluent in English and Farsi, Dr. Naji earned his medical degree from the Tehran University of Medical Sciences School of Medicine, followed by a internship and residency in internal medicine at Wright State University. Subsequently, he completed a dual fellowship, one in cardiovascular disease at the State University of New York, Upstate Medical University and the other in interventional cardiology at Newark Beth Israel Medical Center. Certified by the American Board of Internal Medicine and cardiovascular disease, Dr. Naji has authored numerous journal publications in his field of specialization and has given many presentations at professional society meetings. He is also an active member of the Society for Cardiovascular Angiography and Interventions, the American College of Cardiology, and the American Heart Association. Outside of medicine, he enjoys photography, aviation, movies, and traveling.